VoiceComputer is about making every element of your computer accessible and making everything work together so that voice computing is easy to use and highly productive. VoiceComputer doesn�t break barriers, it eliminates them! VoiceComputer, the best speech recognition software, brings unprecedented usability and accessibility to Dragon. The reason is simple: Our Intag speech interface delivers the simplest, most accessible, versatile and productive voice control of your computer ever. Delivers up to 100% hands-free computer control. Probably The Most User-Friendly And Ergonomic Way To Control Your Computer. Ever. VoiceComputer brings usability, productivity, ease-of-use and unprecedented accessibility to speech recognition. 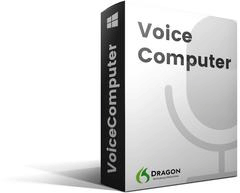 VoiceComputer is the all-in-one add-on for Dragon. It works with Dragon to let you control your computer with little or no mouse use, no keyboard, and no stress. Enjoy the easiest, fastest, and most accessible hands-free control of your own computer today. Fast and easy speech control of Windows, your applications, files and folders and the Internet. VoiceComputer is the most hands-free and truly user-friendly way to control your computer with speech recognition. It makes Dragon better because it gives you productive control and access to everything others can do with a mouse and keyboard. VoiceComputer was designed for both those who have difficulty using their hands and those who have physical challenges that prevent them from using conventional computer input devices. VoiceComputer Is The Only All-In-One Dragon / Speech Recognition Solution. VoiceComputer is the best in speech recognition because it was designed as we trained and worked with our users. It has the most complete feature set in speech recognition because that's what our users needed to do their jobs. View our demos. And, ask us for a free evaluation copy. We designed it to change your life. VoiceComputer brings you comprehensive interactive help and learning at every stage as you use speech recognition. Thus, you will actively participate in learning as you ask for and receive exactly the instructions that you need, without interruption, when you want it, while you work. With Dragon, you may eventually learn what you can do by trial and error, but with a lot of frustration. With VoiceComputer, If You Want To Know How To Do Something: Just Ask! With VoiceComputer, you will enjoy instant, hands-free access to a complete user manual. You will be able to learn as you work, helping you get your work done. VoiceComputer is made for all learning styles. It includes tutorials, videos, exercises, help screens and comprehensive lessons for Dragon. Now you can master speech recognition with the most comprehensive Dragon training guide and user documentation available. VoiceComputer allows you to size, position, and/or switch to any application on your desktop with only one or two speech commands. Now you can size, position and switch to any application even when you have 10, 20 or more applications open and you're using multiple monitors. With other programs, the same activity could take a dozen commands. The Windows desktop is where you get your work done. We make it easy to keep it organized and productive. VoiceComputer’s Voice Mouse is the most complete and productive speech-controlled mouse ever. Far faster, easier-to-use and much more powerful than Dragon’s mouse commands, our Voice Mouse is essential for those who need hands-free control of their computers. VoiceComputer’s mouse commands let you click, double click, ctrl-click, alt-click, shift-click, move, and drag and drop in a single command or two. In addition, the Voice Mouse supports up to three monitors. "the more I use it, the more impressed I am and love it!" The VoiceComputer Microphone lets you enjoy complete hands-free accessibility. The VoiceComputer microphone is always listening in the background, letting you turn on the Dragon microphone, restart / shutdown Dragon (and VoiceComputer) and even restart / shutdown your computer. Is the Dragon microphone turned off? Just say, "Wake up Wake up*". Need to shutdown or restart your computer? "Computer Computer*" and you'll be able to restart Dragon or restart your computer. * Our microphone, like the rest of our product, is unique. It uses a sequence of two commands in order to help prevent false positives (where the speech engine turns on the Dragon microphone or restarts Dragon because it misheard you). You can easily customize VoiceComputer without scripting or programming. 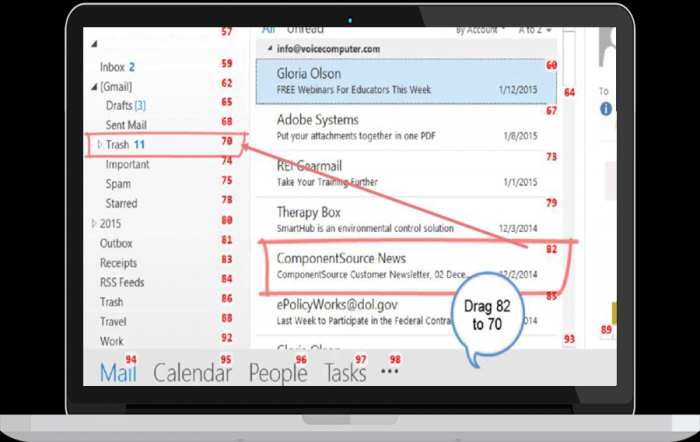 Now you easily create Move to and Change to Folder commands for Outlook, Lotus, or GroupWise. Now you can create keyboard and mouse commands without scripting. Access Your Files At The Speed Of Sound. VoiceComputer has dozens of navigation commands that let you quickly and simply move through your documents by voice. Get your work done with the easiest and most complete voice navigation commands available. For example, VoiceComputer lets you scroll and/or page up and down through virtually any Windows application and you can set the scrolling / paging speed from a blur to a line at a time. 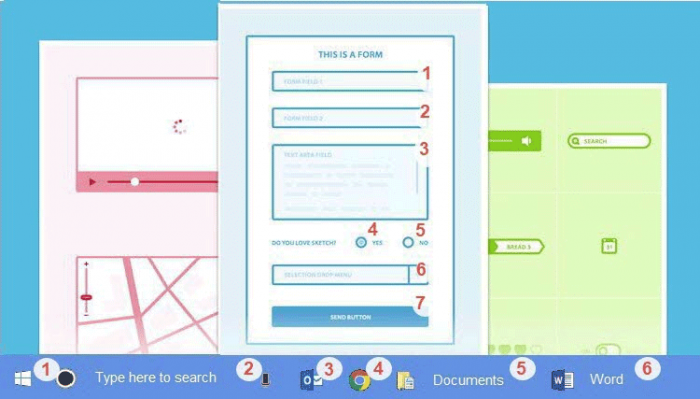 VoiceComputer even lets you move through other documents, web pages, or applications and copy from them, as you continue working in your own document. VoiceComputer’s proprietary My InTags technology lets you make any screen accessible with an incredibly easy-to-use voice template system. No scripting or programming necessary! Fast. 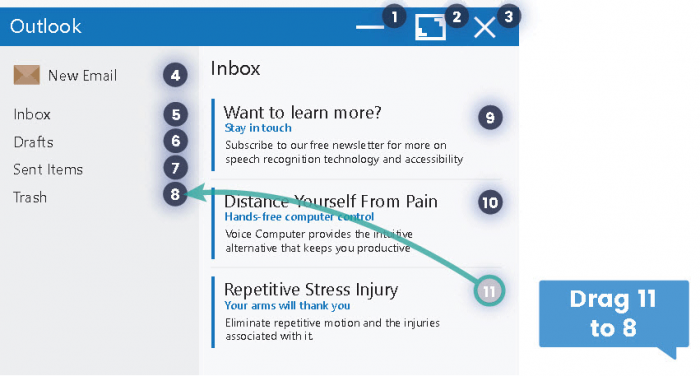 The simplest and fastest way to access and control previously inaccessible screens. Easy Now you'll be able to easily access and control thousands of windows and screens that you could never access with only Dragon! Easy. Now you'll be able to easily access and control thousands of windows and screens that you could never access with only Dragon! We can customize our InTags speech interface so you can easily control anything and everything on your computer by voice, including complex, mouse-intensive applications and databases. Fast and Simple. We eliminated unnecessary commands. For example, our numbered overlay reopens after each command, simplifying control and letting you quickly control and drill through applications. Complete. InTags offers complete mouse control. You can issue any mouse command (click, double, right, & shift click) and drag and drop, etc. 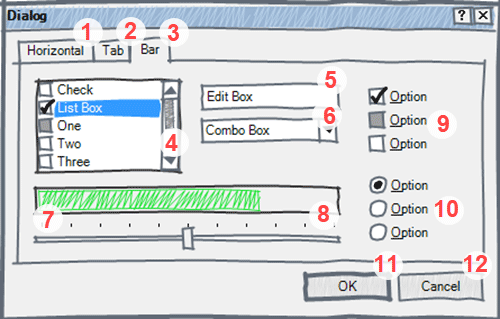 You can even create your own commands by combining any combination of clicks and keys that you want. VoiceComputer's Intag commands almost extinct. Features the world’s first ergonomic user interface. For all of us. VoiceComputer is an all-in-one solution that provides unequaled ease-of-use, accessibility and fast, productive control of the Windows desktop, file system, your applications, and the Internet. VoiceComputer is so easy to learn that you can actually greatly reduce your mouse / touchpad use today. In minutes. VoiceComputer integrates and works in conjunction with all versions of Dragon Premium, Professional, Professional Individual, Professional Group, Legal and Medical 10-15. With your purchase of VoiceComputer you'll qualify for free updates (by download) until the next version of Dragon (Dragon usually releases a new version every 2 years). VoiceComputer has several updates a year and you can download them at your convenience. What are VoiceComputer's minimum requirements (hardware and software)? InTag also works with Windows Speech Recognition. Windows 7, 8 or 10 (32-bit or 64-bit), . Storage device (USB/ CD Burner /Network) for backing up voice files. An available USB port for sound pod. A high-quality microphone and USB sound pod.